Nile Swim Club General Manager Terrence Satterfield, Board members Lisa Ivery, center, and Athony Patterson by the pool grounds on Sept. 12, 2018. When Lisa Ivery was a little girl, she spent many summer days at Yeadon's Nile Swim Club. From open to close, rain or shine, you could find her in the water, playing games she and other kids had invented, or just laughing and having a blast. "At the time, it was the place that everybody wanted to be," Ivery said. But the Nile of Ivery's youth is not the Nile of 2018. Like other area swim clubs — many of which were created when there were fewer social outlets for children in the summer — the Nile fell on hard times. 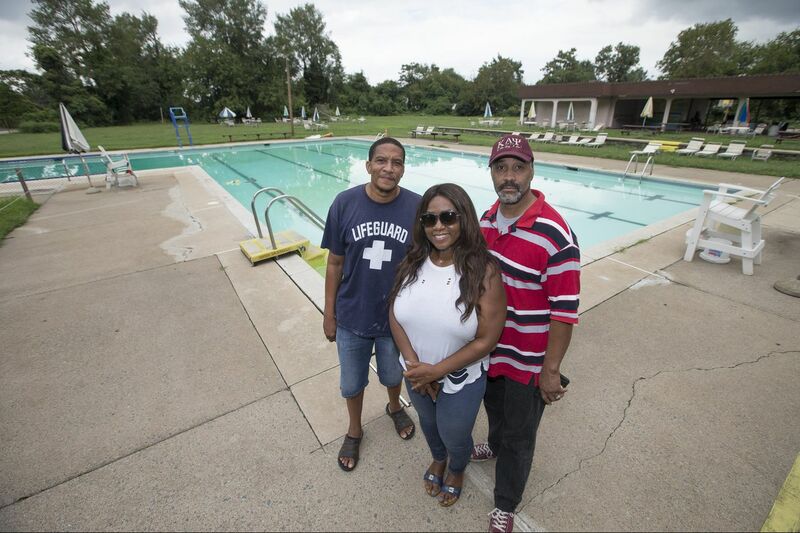 After filing for bankruptcy twice since 2010, the nation's first African American-owned swim club recently turned to the community to help claw its way back from the brink of foreclosure, board members said. Delaware County was set to sell the 59-year-old pool on Sept. 13 to cover back taxes. That is, until a CrowdRise crowd-funding campaign started — and friends of the pool stepped up. They raised about $40,000, enough to give the club until the end of the year to pay the rest of the back taxes — an amount totaling more than $150,000, according to the Nile's president, Christopher B. Sample. Board members said they are confident they will be able to pay it. "No, we're not going to lose the club," said Ivery, 49, a member of the Nile's governing board. "This is what we need to do to bring it back to its glory days," said fellow board member Anthony Patterson, 54. Nile Swim Club board member Anthony Patterson looks over the pool grounds. Their ultimate goal is to raise $1 million, which would be used to pay the back taxes and to"renovate and beautify" the facilities, possibly even to add an indoor area for year-round events, Sample said. "They have a special place in Yeadon, and indeed in the whole county," said John McBlain, chairman of Delaware County Council. "We want to be as flexible as possible and work with the Nile Swim Club." To many in Yeadon, this campaign is personal. The Nile traces its roots to 1957, when several African American families were denied membership to nearby swim clubs in Yeadon and Lansdowne. "Yeadon was an enclave for very successful African Americans," Patterson said, "and they could not join in these swimming clubs." Determined not to let discrimination keep their children from swimming, the founding families purchased a plot of land on Sullivan Field, now Yeadon Community Park, and formed a nonprofit. By 1959, the Nile opened its doors on Union Avenue. Named after the African river, the Nile quickly became an integral piece of the Delaware County community, holding swim lessons and hosting parties. Longtime members talk of legendary nights when West Philadelphia native Will Smith would DJ by the pool. As the Nile grew in popularity, it expanded, adding basketball and tennis courts to its 4.5 acres. An undated photo of the Nile Swim Club during its heyday. Patterson, the youngest of 19 children, worked at the pool as a teen. His family could not afford a membership, he said, so working there was his only option if he wanted to swim. When he became a father himself, Patterson taught his son, Anthony Jr., now 24, how to swim at the Nile, he said. Patterson has become so devoted to the place, he said, because of those who sacrificed to create it. "I will not see, I cannot see, the Nile Swim Club lost to sheriff's sale," Patterson said. "I truly honor those founding families." Nile Swim Club board members Anthony Patterson, left, and Lisa Ivery by a mural on the pool grounds. As a child, Ivery said, her teammates in various sports would talk about going to the Lansdowne Swim Club. But when her mother tried to join, her application was denied. Ivery said she remembers her mother's anger and confusion — her mom was "good enough" to cart her teammates to practice or lead the Girl Scout Troop — but she couldn't join the pool of which many other community members were a part. "The Nile was our only option at the time," Ivery said. For an avid swimmer like herself, the pool was perfect. Over time, however, Ivery said she watched it fall into disrepair. It has not been updated in nearly 60 years, Sample said. Sample said one issue is that the swim club is taxed for 12 months of the year, but only open in the summer. During some seasons, such as this past one, rain forced the pool to close many days, which also meant the club returned funds to guests who had booked the Nile for parties. Members of the Nile Swim Club in Yeadon swim during its annual Community Day. In the push to save the pool, Sample said board members are drafting a letter to Will Smith in hopes he might be able to help spread the word about the national fund-raising campaign. Sample would like to see the Nile become a historical destination. "We always talk about this need to make sure our history and our culture are kept in place," said Sample, one of a few board members who aren't lifelong members of the club. "I came to this club as a cause." A sticker on the front entrance of the Nile Swim Club. The board is so confident the pool will remain open that they are already looking to the 2019 season. They hope to double the current membership of 150 (this number includes family memberships), and plan to start a camp, No Child Will Drown in Our Town, which will teach children how to swim free of charge. "For young children, they need to have access to swimming facilities," Sample said. And "African American children drown more than most." Ivery said she sees the camp as another example of the Nile serving the folks of Yeadon. "You have to be willing to give back to the community," Ivery said. "Even in your worst times, you have to be willing to give something back." An alligator in the Nile Swim Club pool is meant to scare away geese.